Monthly Motoring is this weekend! We will meet at the Starbucks in the 12 Oaks shopping center at 10AM on Sunday, November 5th, in Savannah (5500 Abercorn St). We don't really have any solid plans - just gonna' wing it and have a great time! I plan to drive down on Sunday morning. If anyone from Charleston want to go with, just let me know. Greetings and welcome to my Blog! 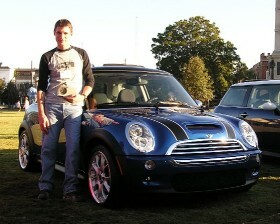 My name is Matt and I am a MINI Motoring Advisor with MINI of Charleston in Charleston, SC. Not only am I an employee of the dealership, I am also a client! My MINI's name is Morris and he was adopted on July 16th, 2005 (but who's counting). I hope this page will provide some interesting and insightful information on all things MINI. Please feel free to leave comments as you like; I am always up for suggestions! Happy Motoring! A Brief Reflection on the "Goonies"
It's Movies in the Park time again!